The Hinkley Sussex double wall light in brushed nickel finish and Georgian style, with tall rectangular bevelled edge wall mount and two flared curved arms. The lamp arms are encased in clear glass and fitted with a white fabric hard backed shade. The Sussex suite offers traditional charm with an edge of modern luxury. The Brushed Nickel finish, white fabric hard back shade and clear glass column and candles adds to its sophistication. The understated Georgian influence provides a soft yet stylish look for almost any room. The white fabric shades diffuse the light evenly and illuminate the room with a soothing glow. A simple yet thoroughly stylish designer twin wall light that will look fantastic in both traditional and contemporary settings. Please note: This wall light is not fitted with a switch. Part of the Sussex lighting suite that can be viewed below and includes a large nine-light and five-light chandeliers, a semi-flush fitting and single wall light. This classic period light is designed in the USA by Hinkley Lighting, founded in 1922 in Cleveland, Ohio. 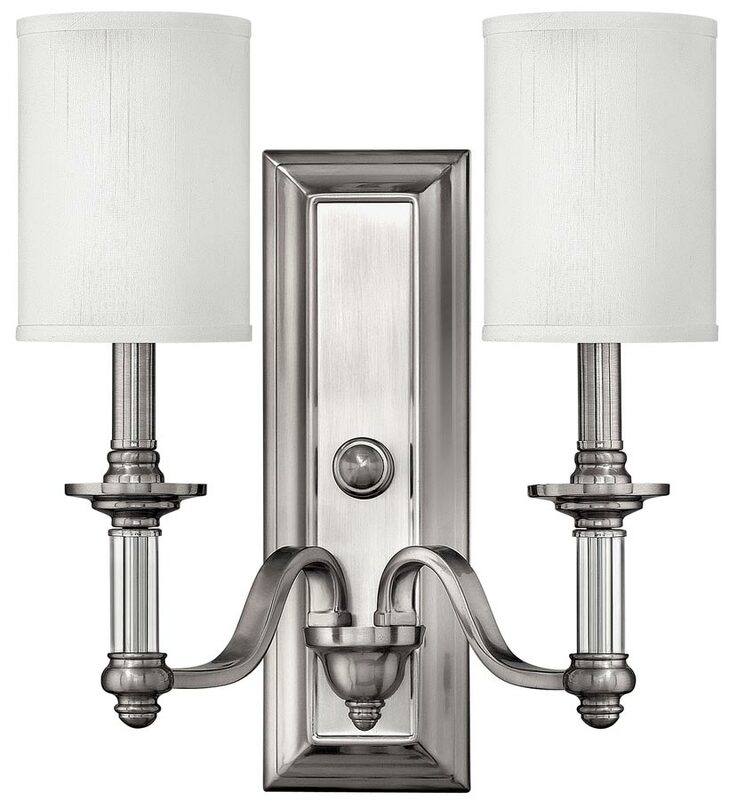 They have transformed from a small outdoor lantern company to a global brand intent on bringing you the best in style, quality and value, such as the Sussex double wall light in brushed nickel finish and Georgian style you see here.